The passion fruit grows from southern Brazil through Paraguay to northern Argentina, and it has been stated that the yellow form is perhaps from the Amazon region of Brazil. The nearly round or oval fruit, has a rind that is smooth and waxy, ranging in colour from dark purple with fine white specks, to light yellow or creamy orange. Within the cavity is an aromatic mass of double walled membrane sacs containing orange coloured, juice, and dark brown or black, pitted seeds. Eating passion fruit begins with knowing what to look for when purchasing them. The best time to purchase passion fruit is from December to July and the fruits vary in size from about the size of an orange to the size of a grapefruit. Passion fruit has a shiny skin when freshly picked, however, the skin becomes wrinkled and shriveled as the fruit ripens. Passion fruits are refreshingly tart when fresh, but the flavor becomes sweeter as the fruit matures. Passion fruit is a nutritious, tropical fruit that can be eaten in plenty of different ways. Passion fruit can be enjoyed all by itself. Begin by thoroughly washing the fruit and cut in half using a serrated knife, and try not to spill any of the juice. Scoop out the contents, seeds and pulp using a spoon into a bowl and enjoy. If you prefer, you can sprinkle some sugar into the fruit for a sweeter taste. However, try not to scrape the skin because the white layer is bitter and not very tasty. 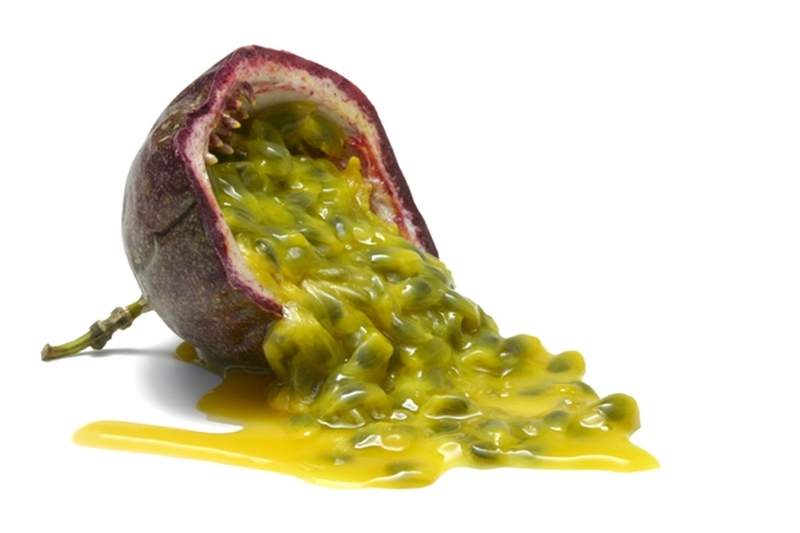 Prepare the passion fruit by scooping out the pulp and warm. Gently heating the pulp on the stove or in the microwave renders the passion fruit pulp easier to strain. To remove the seeds, strain the warm pulp through a fine sieve. The seeds can sometimes be reserved to use as a decoration. Enjoy it by itself or mix it with other ingredients as a fruit cocktail. A basic passion fruit sauce is made with seedless pulp from 2-3 fresh ripe passion fruits, one tablespoon lemon juice, and ½ cup of sugar. Try braising chicken with the sauce while grilling it, or ladle some sauce over your favourite fish or sushi rolls. Vegetable lovers can also blend it with some olive oil to make a unique salad dressing. If you really want to know how to eat passion fruit, try making some deserts with it. Passion fruit is often used for baking and in desserts. It has an intensely aromatic flavour that goes well with cream, coconut, chocolate (especially dark chocolate), citrus, mango, and pineapple. Favorited recipes include passion fruit mousse, fruit bars, and passion fruit frosting. Yields 8 to 10 portions. Preparation time: Approximate 2 ½ hours. ½ cup passion fruit juice (about 10 passion fruits). Save some seeds for decoration. Using an electric mixer with the whisk attachment, or whip up the cream by hand until it stiffens into peaks. Then fold in the passion fruit juice, condensed milk, vanilla extract and mix until everything is evenly distributed. Hold the mixture in a glass container with plastic wrap or a plastic container with a lid and place in the refrigerator for about two hours before serving. Top with some seeds for decoration. 1/3 cup passion fruit pulp. Save some seeds for decoration. Preheat the oven to 350 degrees F (180 C). Brush an 8 in (20 cm) baking pan with oil. Beat butter, powdered sugar and passion fruit pulp with electric beater until light and creamy. Top the fruit bars when fully cooled with the frosting, and decorate with some of the passion fruit seeds. Transfer the mixture to a large bowl and sift in the plain and self rising flours. Add the passion fruit pulp and mix until just combined. Pour the mixture into the baking dish for 35 minutes or until golden brown. Remove from oven and let cool for 10 minutes before turning it out onto a rack. Meanwhile, prepare the frosting. For more passion fruit recipes for main course, starter, dessert and cocktails, click HERE. Passion fruit is a powerful source of antioxidants needed to help get rid of free radicals that are known for changing healthy cells into cancerous cells. Passion fruit also contains vitamin A, phenolic compounds, and various flavonoids, all of which have been linked to helping prevent cancer. Passion fruit adds a boost to the immune system due to the presence of vitamin C, cryptoxanthin, and carotene. Vitamin C stimulates the activity of white blood cells in the body that fights illness and keeps us healthy. Passion fruit is a good source of soluble fiber, the substance that facilitates the digestion of food and helps regulate bowel movements. Fiber is an essential component of a healthy diet, and a single serving provides the human body with approximately 98% of its daily requirement. Vitamin A is also linked to improvements in eye health, including the prevention of cataracts, night blindness, and macular degeneration. Passion fruit contains a high iron and copper content and the vasodilating benefits of potassium. Since Iron and copper are critical components of red cell production, and the blood vessels are dilated by the potassium, oxygen rich blood can reach all the necessary areas of our bodies.